Fuji just announced a quartet of megazoom (read: fixed lens) cameras in a Monday blitz, with the most impressive being this HS10. It won't give the level of control of a DSLR, but it looks to blow away any point-and-shoot. The 10MP HS10, pictured, is an interesting beast: It's got a 30x manual optical zoom (24-720mm equivalent), meaning you can twist the lens like on a detachable DSLR (which does give faster and more accurate control), which is something I've never seen before in a fixed-lens camera. It'll also take 1080p video, including "a new Super High Speed Movie mode" that can take slow-motion video at up to 1000fps, and it has a 7-frame burst mode at 10fps. 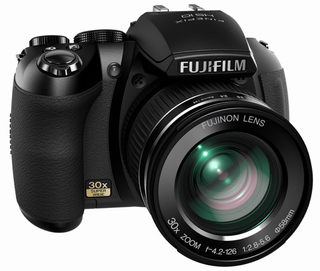 It's also got great low-light performance thanks to its new BSI-CMOS sensor, and takes simultaneous RAW and JPEG shots. It'll be available in April for $500. The other two megazooms, the S1800 and S2550HD, are pretty similar; they're both 12MP shooters with an 18x zoom, 28mm-504mm lenses, 720p video recording and a 3-inch LCD. The differences: The S1800 has automatic picture rotation and tracking autofocus, while the S2550HD has a miniHDMI-out port. The S1800 will cost $230 and the S2550HD $250 when they're released this March.